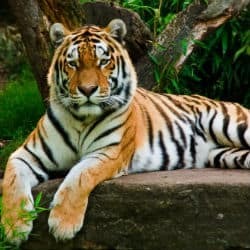 Currently the only species of tiger that lives in a predominantly snowy habitat is the Amur tiger following the extinction of the Caspian tiger. However, it would now appear that the Indian Subcontinent’s Bengal tiger will likely be next species to embrace snow largely as a result of climate change. The high-altitude areas of Nepal, India and Bhutan with a combined area of 52,671 square kilometres between them could well end up serving as potential habitats for Bengal tigers according to a recent study. The study which is a collaboration between the governments of all three countries as well as WWF, Wildlife Institute of India and National Trust for Nature Conservation and Global Tiger Forum is currently in its second phase. The first phase started last April after Bengal tigers were spotted at altitudes exceeding 4,000 metres in Bhutan and India. Experts say the reason tigers are moving higher is in response to climate change. One of the main reasons behind conducting the study is to find better conservation methods for tigers as climate changes has a greater impact on vegetation and the weather makes the species more vulnerable. The study’s objective is to track tigers at high altitude and to develop monitoring mechanisms. In order to track tigers at high altitude the agencies participating in the study are using camera traps, GIS mapping as well as surveying the local population. Whilst tigers have most certainly been seen in the areas that are under study, what researchers have not been able to determine is whether the tigers that have been spotted are part of a resident population of tigers, or whether these are sporadic migrating tigers. The second phase of the study will try to determine the answer to this question. Experts says that the current tiger population estimation process has not included these areas, so it is highly possible that there is a large proportion of the tiger population that simply has not been accounted for. You can adopt animal from just £3.00 a month. You will receive a fantastic gift pack and know you are helping to give wildlife a chance. Adopt an Animal is a website dedicated to the protection of wildlife through animal adoption gifts. We are a privately owned website that is an authorised promotional partner of WWF. Read more about us.